Does an Aquarium Need a Recirculation Pump? 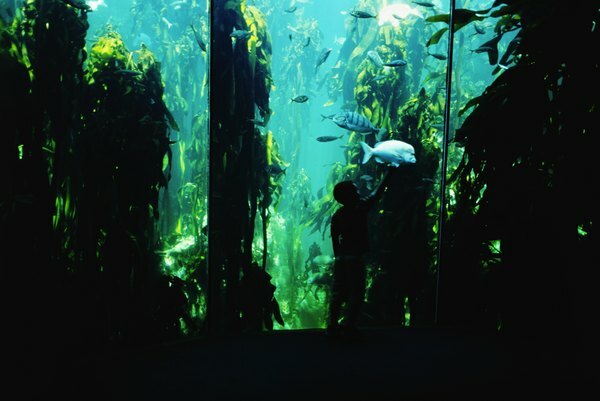 Aquariums vary wildly in their current requirements. Some aquariums need recirculation pumps, others don't. Some aquarium creatures need more water movement than others. In fact, for some organisms, extra water movement can be the difference between success and failure, while others will struggle in the current. Your tank's population will dictate if a recirculating pump is necessary. Most of the gas exchange in an aquarium happens at the water's surface. So lots of water movement, particularly in the top levels of the aquarium, improves oxygenation. Some fish and invertebrates need more oxygen than others. For example, warm water and saltwater have a reduced ability to hold oxygen, so extra water movement can improve conditions drastically. If you have fish that hail from saltwater or the tropics, a recirculation pump can greatly improve conditions for your fish. Many fish have adapted to fast-moving streams. This includes plecos, loaches and other flattened bottom-dwelling fish. Moving water mimics their home waters and makes these fish feel more at home and safe. Additionally, these fish have almost-universally adapted to highly oxygenated water. On top of these other benefits, the extra water movement from a recirculating pump may trigger spawning in some of these species, including some of the plecos. Recirculating pumps, or other types of water pumps, are a necessity for reef aquariums. Marine invertebrates like coral have adapted to surging ocean currents, and they depend on them to wash away waste and bring food and oxygen. You may need to connect your recirculating pump to a device called a wavemaker for the best effect. Wavemakers coordinate a group of pumps, or turn a single pump on and off, to generate wave-like water movements for your reef aquarium. For a few fish, excessive water movement can cause problems. For example, the betta or Siamese fighting fish has long, flowing fins. This makes it harder for the fish to swim against current. In this case, a recirculation pump could make life hard for the fish. Long-finned varieties of goldfish and freshwater angelfish may have similar problems. In the marine side of the aquarium hobby, seahorses are the classic example of this issue, since they swim weakly. Additionally, when breeding most species of aquarium fish, you want to use as little water movement as possible, since baby fish are weak swimmers. Is a Catfish Sick If It Is Swimming on Its Side on the Bottom of a Tank?